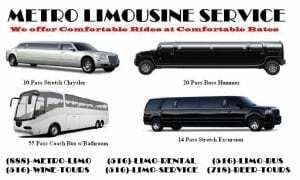 Limousine, Party Bus Service Provided by Metro Limousine Service of Long Island, NY. Long Island Brewery Tours is an exciting service offering the opportunity for Tastings and Tours to the outstanding Breweries here on Long Island. Using our Limousines, Limo/Party Buses and our experience in providing quality service, you are sure to enjoy the many wonderful varieties of Beer as you tour the Best of Long Island Breweries.